This is a lovely post Erin. First, I love the photo with the blue china and the beautiful roses and your garden looks so beautiful with all those bright colors. Now, for my favorite gates. Of course, I love the blue one, but I also love the one with the long white fence with old roses (house N°380). All these beautiful gates, houses and gardens make my day and make me dream. Beautiful painting and I love garden gates! Love this painting Erin and I love looking at people's garden gates as well. Such a pretty subject. Have a creative weekend. Erin, what a sweet tour! I wish I could have been walking with you! 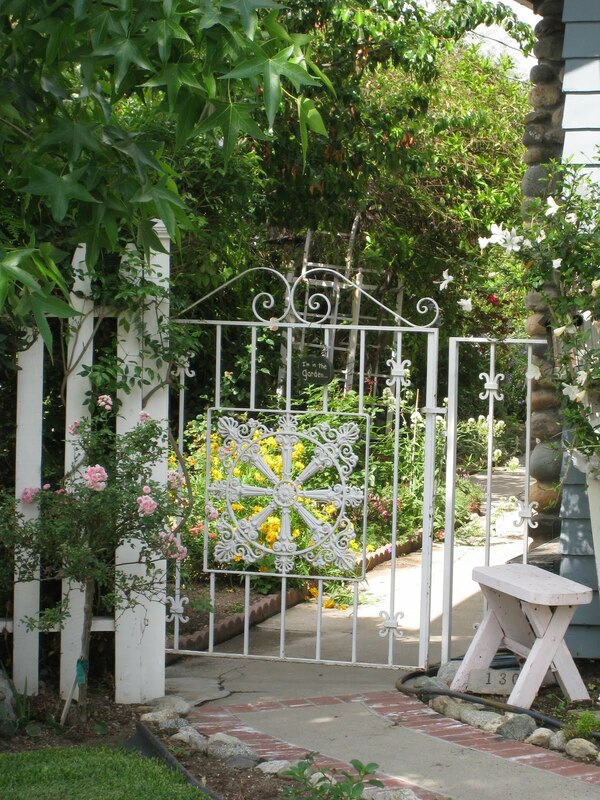 I love picket fences and garden gates too! Always make me want to peek inside and see what is beyond. What wonderful gates!! Your picture is lovely Erin. Have a great blog break. So excited to find your blog through my dear friend Ruth. Love the first pic with the blue and white dishes. I have my mother and grandma's old blue willow and love it in my tuscan kitchen. 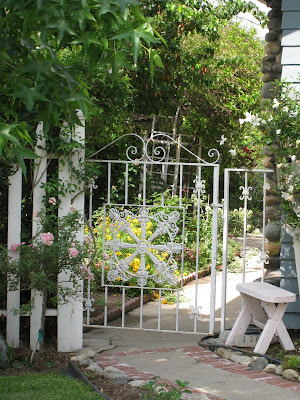 The garden gates are delightful and such inspiration for the cottage. So enjoyed my visit here. Your blog is lovely and you are so talented. Hi again Erin, forgot to say, Bently is a doll. My Miss Beazy is my studio assistant too. Isn't is a great day creating with them? Just recently found your blog and love it! The gardening season is so short in MN and I treasure every moment of it. Thank you for the wonderful inspiration. I've enjoyed looking at your pictures and paintings. I'll be back often. The gates and little cottages are beautiful! So uplifting on a dark and stormy day here in Ohio. Glad to have found your blog. Looking forward to seeing more paintings. Hi Erin, I love this post! Those are some lovely, lovely garden gates...great photos. I have a gate that leads into my courtyard, my gate is not that special though, but this has inspired me to maybe get creative! I like the pictures of your garden gates. They look so beautiful. I would recommend KP Engineering Works Ltd for amazing and beautiful garden gates designs. They are experienced in building Garden gates as per your requirements.